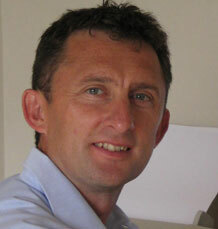 Chris Perry is a Professor in Tropical Coastal Geoscience at Exeter. His research seeks to address questions about the response of coral reefs and reef landforms to environmental and climatic change. Key areas of on-going research are aimed at: (1) improving understanding of rates of coral reef and marine carbonate sediment production; (2) quantifying the impacts of environmental change on coral reef growth rates; (3) improving understanding of reef development in more marginal marine settings, and especially in high turbidity coastal settings; and (4) quantifying rates and timings of coral reef island development. Recent and on-going research has encompassed studies in both the Indo-Pacific (Australia, Chagos, Mauritius, Mozambique, Maldives) and Caribbean regions (Jamaica, Mexico, Barbados, The Bahamas, Bonaire, Belize), and his research has been funded through the UK Research Councils (specifically NERC), Charitable Trusts (The Leverhulme Trust, The Royal Society, Nuffield Foundation) and industry (BG Group). Chris is Coordinator of ReefBudget - a census based method for determining reef carbonate budgets - initally set up through a Leverhulme Trust International Research Network, and more recently expanded through funding from the Leverhulme Trust and Bertarelli Foundation. Chris is also a member of the NERC Peer Review College. He has published > 100 peer-reviewed papers and edited book chapters, and co-authored 1 undergraduate textbook. (4) quantifying rates and timings of coral reef island development. (1) Quantifying the impacts of the 2016 coral bleaching event on reef carbonate budgets in Chagos, British Indian Ocean Territory (funded by the Bertarelli Foundation). (2) Predicting the significance of fish carbonates to the marine carbonate cycle (funded by the Leverhulme Trust). (3) Building capacity for monitoring the physical functionality and resilience of coral reef ecosystems along the Mesoamerican Reef (funded by a Royal Society - Newton Advanced Research Fellowship). 2017-2018. Global Challenges Research Fund: Resilience Foundation scheme. Building Socio-Ecological Resilience to Coral Reef Degradation in the Islands of the Western Indian Ocean. 2016 NERC Urgency (NE/P007694/1) Quantifying ENSO-related bleaching on nearshore, turbid-zone coral reefs: a test of the turbid-zone reef climate change refugia hypothesis. 2016-2017 The Leverhulme Trust. Research Fellowship: Coral reef carbonate production and reef island vulnerability. 2013-2017. Natural Environment Research Council (NE/K003143/1) Carbonate sediment production by marine fish: quantifying production across carbonate provinces and applications to global marine carbonate modelling. 2012-2013. Natural Environment Research Council (Radiocarbon Dating Allocation). Terrigenous sediment-dominated reefs as precursors for shelf-reef development. 2012-2016. Natural Environment Research Council (NE/J023329/1) Exploring the hidden shallows: inner-shelf reef growth and future trajectories of reef geomorphic change. 2011-2012. Natural Environment Research Council (Radiocarbon Dating Allocation). Rates and timescales of lagoon infilling as a control on reef island development. 2011-2012. Natural Environment Research Council (NE/J005398/1). Rapid assessments of Cyclone Yasi’s impact on nearshore coral reefs and resultant sediment records of the event. 2010-2011. Natural Environment Research Council (Radiocarbon Dating Allocation). Testing models of episodic, inner-shelf reef ‘turn-on‘ and ‘turn-off‘ events at regional and intra-reefal scales. 2010-2013. Natural Environment Research Council (NE/H010092/1). Fish carbonates – their nature and fate within the marine inorganic carbon cycle. 2009-2011. The Leverhulme Trust – International Research Network (F/00426/G). Development of a rapid carbonate budget assessment protocol for coral reefs. 2009-2010. Natural Environment Research Council (Isotope Geosciences Allocation). Palaeo-ecological records of terrestrial run-off and sediment influence on coral reef ecosystems: a case study from King Reef, Northern Queensland, Australia. 2009-2013. Natural Environment Research Council (NE/G011389/1). Criteria for interpreting carbonate platform drowning histories and resultant diagenetic fabrics: insights from actively subsiding platform margins. 2009-2010. Natural Environment Research Council (NE/G010617/1). The production and fate of fish-derived carbonate crystals in tropical shallow water environments. Perry C, Morgan KM (In Press). Bleaching drives collapse in reef carbonate budgets and reef growth potential on southern Maldives reefs. Scientific Reports Full text. Perry C, Murphy GN, Kench PS, Smithers SG, Edinger EN, Steneck RS, Mumby PJ (In Press). Caribbean-wide decline in carbonate production threatens coral reef growth. Nature Communications(4). Full text. East H, Perry C, Kench P, Liang Y, Gulliver P (In Press). Coral Reef Island Initiation and Development Under Higher Than Present Sea Levels. Geophysical Research Letters Full text. Perry C, Kench PS, O'Leary MJ, Morgan KM, Januchowski-Hartle F (In Press). Linking reef ecology to island-building: Parrotfish identified as major producers of island-building sediment in the Maldives. Geology (Boulder), 43, 503-506. Full text. Morgan KM, Perry CT, Johnson J, Smithers SG (In Press). Nearshore turbid-zone corals exhibit high bleaching tolerance on the Great Barrier Reef following the 2016 ocean warming event. Frontiers in Marine Science Full text. Perry C (2018). Loss of coral reef growth capacity to track future increases in sea level. Nature Full text. Lange I, Perry CT (In Press). Bleaching impacts on carbonate production in the Chagos Archipelago: influence of functional coral groups on carbonate budget trajectories. Coral Reefs Full text. Perry C, Salter M, Morgan K, Harborne A (In Press). Census estimates of algal and epiphytic carbonate production highlight tropical seagrass meadows as sediment production hotspots. Frontiers in Marine Science Full text. Perry C, Smithers SG, Kench PS, Pears B (In Press). Impacts of Severe Tropical Cyclone Yasi on nearshore, terrigenous sediment-dominated reefs of the central Great Barrier Reef, Australia. Geomorphology, 222, 92-105. Full text. Johnson J, Perry CT, Smithers SG, Morgan KM, Santodomingo N, Johnson K (In Press). Palaeoecological records of coral community development on a turbid, nearshore reef complex: baselines for assessing ecological change. Coral Reefs Full text. Salter MA, Harborne AR, Perry CT, Wilson RW (In Press). Phase heterogeneity in carbonate production by marine fish influences their roles in sediment generation and the inorganic carbon cycle. Scientific Reports Full text. Perry C (In Press). Post-bleaching coral community change on southern Maldivian reefs: is there potential for rapid recovery?. Coral Reefs Full text. Salter MA, Perry CT, Stuart-Smith R, Edgar GJ, Wilson RW, Harborne AR (In Press). Reef fish carbonate production assessments highlight regional variation in sedimentary significance. Geology Full text. Perry C, Morgan K, Yarlett R (In Press). Reef habitat type and spatial extent as interacting controls on platform-scale carbonate budgets. Frontiers in Marine Science Full text. Perry C, Murphy G, Graham NAJ, Wilson SK, Januchowski-Hartley F, East H (In Press). Remote coral reefs can sustain high growth potential and may match future sea-level trends. Scientific Reports Full text. Perry C, Morgan KM, Salter MA (In Press). Sediment generation by Halimeda on atoll interior coral reefs of the southern Maldives: a census-based approach for estimating carbonate production by calcareous green algae. Sedimentary Geology Full text. Morgan KM, Perry CT, Smithers SG, Johnson JA, Gulliver PA (In Press). Transitions in coral reef accretion rates linked to intrinsic ecological shifts on turbid-zone nearshore reefs. Geology (Boulder) Full text. © 2018 the Authors. Functional Ecology © 2018 British Ecological Society the ecology of many coral reefs has changed markedly over recent decades in response to various combinations of local and global stressors. These ecological changes have important implications for the abundance of taxa that regulate the production and erosion of skeletal carbonates, and thus for many of the geo-ecological functions that coral reefs provide, including reef framework production and sediment generation, the maintenance of reef habitat complexity and reef growth potential. These functional attributes underpin many of the ecosystem goods and services that reefs provide to society. Rapidly changing conditions of reefs in the Anthropocene are likely to significantly impact the capacity of reefs to sustain these geo-ecological functions. Although the Anthropocene footprint of disturbance will be expressed differently across ecoregions and habitats, the end point for many reefs may be broadly similar: (a) progressively shifting towards net neutral or negative carbonate budget states; (b) becoming structurally flatter; and (c) having lower vertical growth rates. It is also likely that a progressive depth-homogenisation will occur in terms of these processes. The Anthropocene is likely to be defined by an increasing disconnect between the ecological processes that drive carbonate production on the reef surface, and the net geological outcome of that production, that is, the accumulation of the underlying reef structure. Reef structures are thus likely to become increasingly relict or senescent features, which will reduce reef habitat complexity and sediment generation rates, and limit reef potential to accrete vertically at rates that can track rising sea levels. In the absence of pervasive stressors, recovery of degraded coral communities has been observed, resulting in high net-positive budgets being regained. However, the frequency and intensity of climate-driven bleaching events are predicted to increase over the next decades. This would increase the spatial footprint of disturbances and exacerbate the magnitude of the changes described here, limiting the capacity of many reefs to maintain their geo-ecological functions. The enforcement of effective marine protection or the benefits of geographic isolation or of favourable environmental conditions (“refugia” sites) may offer the hope of more optimistic futures in some locations. A plain language summary is available for this article. Yarlett RT, Perry CT, Wilson RW, Philpot KE (2018). Constraining species-size class variability in rates of parrotfish bioerosion on Maldivian coral reefs: implications for regional-scale bioerosion estimates. Marine Ecology Progress Series, 590, 155-169. Parrotfish are important bioeroders on coral reefs, and thus influence reef carbonate budgets and generate large volumes of carbonate sand that contribute to local beach and reef island maintenance. However, despite the importance of this process, there is a paucity of data with which variations in bioerosion rates as a function of species, feeding modes, and body size of parrotfish can be constrained. There is, in addition, limited knowledge regarding how resultant rates may vary within and between reef-building regions. Here, direct estimates of parrotfish bioerosion rates were quantified across different size classes of 6 common species of Maldivian parrotfish. These species comprise both ‘scraper’ and ‘excavator’ taxa, and our data indicate marked variations in mean bioerosion rates among these species. We also note that all species exhibited an apparent bimodal feeding cycle, with peaks in the late morning and early afternoon. Highest bioerosion rates were found in the ‘excavator’ Chlorurus strongylocephalus (~460 kg ind.-1 yr-1), nearly 130 times greater than rates calculated for comparably sized (>45 cm) ‘scraper’ species. Our data provide metrics that can be used in conjunction with parrotfish biomass or density data to improve estimates of parrotfish bioerosion on central Indian Ocean reefs, a region of high parrotfish density, but from which only limited metrics exist. We emphasise the importance of obtaining sub-regional scale process data to better inform estimates of reef bioerosion, especially to support attempts to model the impacts of fishing pressure, which commonly results in removal of high-rate bioeroding taxa. Januchowski-Hartley FA, Graham NAJ, Wilson SK, Jennings S, Perry CT (2017). Drivers and predictions of coral reef carbonate budget trajectories. Proceedings of the Royal Society B: Biological Sciences, 284(1847), 20162533-20162533. Full text. Perry C, Kench P, Smithers S, Riegl B, Gulliver P, Daniells J (2017). Terrigenous sediment-dominated reef platform infilling: an unexpected precursor to reef island formation and a test of the reef platform size–island age model in the Pacific. Coral Reefs, 36(3), 1013-1021. © 2017, Springer-Verlag Berlin Heidelberg. Low-lying coral reef islands are considered highly vulnerable to climate change, necessitating an improved understanding of when and why they form, and how the timing of formation varies within and among regions. Several testable models have been proposed that explain inter-regional variability as a function of sea-level history and, more recently, a reef platform size model has been proposed from the Maldives (central Indian Ocean) to explain intra-regional (intra-atoll) variability. Here we present chronostratigraphic data from Pipon Island, northern Great Barrier Reef (GBR), enabling us to test the applicability of existing regional island evolution models, and the platform size control hypothesis in a Pacific context. We show that reef platform infilling occurred rapidly (~4–5 mm yr−1) under a “bucket-fill” type scenario. Unusually, this infilling was dominated by terrigenous sedimentation, with platform filling and subsequent reef flat formation complete by ~5000 calibrated years BP (cal BP). Reef flat exposure as sea levels slowly fell post highstand facilitated a shift towards intertidal and subaerial-dominated sedimentation. Our data suggest, however, a lag of ~1500 yr before island initiation (at ~3200 cal BP), i.e. later than that reported from smaller and more evolutionarily mature reef platforms in the region. Our data thus support: (1) the hypothesis that platform size acts to influence the timing of platform filling and subsequent island development at intra-regional scales; and (2) the hypothesis that the low wooded islands of the northern GBR conform to a model of island formation above an elevated reef flat under falling sea levels. East HK, Perry CT, Kench PS, Liang Y (2016). Atoll-scale comparisons of the sedimentary structure of coral reef rim islands, Huvadhu Atoll, Maldives. JOURNAL OF COASTAL RESEARCH, 577-581. Author URL. Daw TM, Hicks CC, Brown K, Chaigneau T, Januchowski-Hartley FA, Cheung WWL, Rosendo S, Crona B, Coulthard S, Sandbrook C, et al (2016). Elasticity in ecosystem services: Exploring the variable relationship between ecosystems and human well-being. Ecology and Society, 21(2). © 2016 by the author(s). Although ecosystem services are increasingly recognized as benefits people obtain from nature, we still have a poor understanding of how they actually enhance multidimensional human well-being, and how well-being is affected by ecosystem change. We develop a concept of “ecosystem service elasticity” (ES elasticity) that describes the sensitivity of human well-being to changes in ecosystems. ES Elasticity is a result of complex social and ecological dynamics and is context dependent, individually variable, and likely to demonstrate nonlinear dynamics such as thresholds and hysteresis. We present a conceptual framework that unpacks the chain of causality from ecosystem stocks through flows, goods, value, and shares to contribute to the well-being of different people. This framework builds on previous conceptualizations, but places multidimensional well-being of different people as the final element. This ultimately disaggregated approach emphasizes how different people access benefits and how benefits match their needs or aspirations. Applying this framework to case studies of individual coastal ecosystem services in East Africa illustrates a wide range of social and ecological factors that can affect ES elasticity. For example, food web and habitat dynamics affect the sensitivity of different fisheries ecosystem services to ecological change. Meanwhile high cultural significance, or lack of alternatives enhance ES elasticity, while social mechanisms that prevent access can reduce elasticity. Mapping out how chains are interlinked illustrates how different types of value and the well-being of different people are linked to each other and to common ecological stocks. We suggest that examining chains for individual ecosystem services can suggest potential interventions aimed at poverty alleviation and sustainable ecosystems while mapping out of interlinkages between chains can help to identify possible ecosystem service trade-offs and winners and losers. We discuss conceptual and practical challenges of applying such a framework and conclude on its utility as a heuristic for structuring interdisciplinary analysis of ecosystem services and human wellbeing. Morgan KM, Perry C, Smithers SG, Johnson JA, Daniell J (2016). Evidence of extensive reef development and high coral cover in nearshore environments: implications for understanding coral adaptation in turbid settings. Scientific Reports Full text. Perry CT, Steneck RS, Murphy GN, Kench PS, Edinger EN, Smithers SG, Mumby PJ (2015). Regional-scale dominance of non-framework building corals on Caribbean reefs affects carbonate production and future reef growth. Global Change Biology, 21(3), 1153-1164. © 2014 John Wiley. &. Sons Ltd. Coral cover on Caribbean reefs has declined rapidly since the early 1980's. Diseases have been a major driver, decimating communities of framework building Acropora and Orbicella coral species, and reportedly leading to the emergence of novel coral assemblages often dominated by domed and plating species of the genera Agaricia, Porites and Siderastrea. These corals were not historically important Caribbean framework builders, and typically have much smaller stature and lower calcification rates, fuelling concerns over reef carbonate production and growth potential. Using data from 75 reefs from across the Caribbean we quantify: (i) the magnitude of non-framework building coral dominance throughout the region and (ii) the contribution of these corals to contemporary carbonate production. Our data show that live coral cover averages 18.2% across our sites and coral carbonate production 4.1 kg CaCO3 m-2 yr-1. However, non-framework building coral species dominate and are major carbonate producers at a high proportion of sites; they are more abundant than Acropora and Orbicella at 73% of sites; contribute an average 68% of the carbonate produced; and produce more than half the carbonate at 79% of sites. Coral cover and carbonate production rate are strongly correlated but, as relative abundance of non-framework building corals increases, average carbonate production rates decline. Consequently, the use of coral cover as a predictor of carbonate budget status, without species level production rate data, needs to be treated with caution. Our findings provide compelling evidence for the Caribbean-wide dominance of non-framework building coral taxa, and that these species are now major regional carbonate producers. However, because these species typically have lower calcification rates, continued transitions to states dominated by non-framework building coral species will further reduce carbonate production rates below 'predecline' levels, resulting in shifts towards negative carbonate budget states and reducing reef growth potential. Perry C, Steneck RS, Murphy GN, Kench PS, Edinger EN, Smithers SG, Mumby PJ (2015). Regional-scale dominance of non-framework building corals on Caribbean reefs affects carbonate production and future reef growth. Global Change Biology, 21, 1153-1164. Full text. Perry CT, Murphy GN, Kench PS, Edinger EN, Smithers SG, Steneck RS, Mumby PJ (2014). Changing dynamics of Caribbean reef carbonate budgets: emergence of reef bioeroders as critical controls on present and future reef growth potential. Proceedings. Biological sciences / the Royal Society, 281(1796). © 2014 the Author(s) Published by the Royal Society. All rights reserved.Coral cover has declined rapidly on Caribbean reefs since the early 1980s, reducing carbonate production and reef growth. Using a cross-regional dataset, we show that widespread reductions in bioerosion rates-a key carbonate cycling process-have accompanied carbonate production declines. Bioerosion by parrotfish, urchins, endolithic sponges and microendoliths collectively averages 2 G (where G = kg CaCO3 m(-2) yr(-1)) (range 0.96-3.67 G). This rate is at least 75% lower than that reported from Caribbean reefs prior to their shift towards their present degraded state. Despite chronic overfishing, parrotfish are the dominant bioeroders, but erosion rates are reduced from averages of approximately 4 to 1.6 G. Urchin erosion rates have declined further and are functionally irrelevant to bioerosion on most reefs. These changes demonstrate a fundamental shift in Caribbean reef carbonate budget dynamics. To-date, reduced bioerosion rates have partially offset carbonate production declines, limiting the extent to which more widespread transitions to negative budget states have occurred. However, given the poor prognosis for coral recovery in the Caribbean and reported shifts to coral community states dominated by slower calcifying taxa, a continued transition from production to bioerosion-controlled budget states, which will increasingly threaten reef growth, is predicted. Perry CT, Murphy GN, Kench PS, Edinger EN, Smithers SG, Steneck RS, Mumby PJ (2014). Changing dynamics of Caribbean reef carbonate budgets: emergence of reef bioeroders as critical controls on present and future reef growth potential. Proc Biol Sci, 281(1796). Changing dynamics of Caribbean reef carbonate budgets: emergence of reef bioeroders as critical controls on present and future reef growth potential. Coral cover has declined rapidly on Caribbean reefs since the early 1980s, reducing carbonate production and reef growth. Using a cross-regional dataset, we show that widespread reductions in bioerosion rates-a key carbonate cycling process-have accompanied carbonate production declines. Bioerosion by parrotfish, urchins, endolithic sponges and microendoliths collectively averages 2 G (where G = kg CaCO3 m(-2) yr(-1)) (range 0.96-3.67 G). This rate is at least 75% lower than that reported from Caribbean reefs prior to their shift towards their present degraded state. Despite chronic overfishing, parrotfish are the dominant bioeroders, but erosion rates are reduced from averages of approximately 4 to 1.6 G. Urchin erosion rates have declined further and are functionally irrelevant to bioerosion on most reefs. These changes demonstrate a fundamental shift in Caribbean reef carbonate budget dynamics. To-date, reduced bioerosion rates have partially offset carbonate production declines, limiting the extent to which more widespread transitions to negative budget states have occurred. However, given the poor prognosis for coral recovery in the Caribbean and reported shifts to coral community states dominated by slower calcifying taxa, a continued transition from production to bioerosion-controlled budget states, which will increasingly threaten reef growth, is predicted. Perry C, Steneck RS, Murphy GN, Kench PS, Edinger EN, Smithers SG, Mumby PJ (2014). Changing dynamics of Caribbean reef carbonate budgets: emergence of reef bioeroders as critical controls on present and future reef growth potential. Proceedings of the Royal Society of London: Biological Sciences, 281, 2014-2018. Full text. Hepburn L, Blanchon P, Murphy G, Cousins L, Perry C (2014). Community structure and paleoecological implications of calcareous encrusters on artificial substrates across a Mexican reef. Coral Reefs, 34, 189-200. Roche RC, Perry CT, Smithers SG, Leng MJ, Grove CA, Sloane HJ, Unsworth CE (2014). Mid-Holocene sea surface conditions and riverine influence on the inshore Great Barrier Reef. Holocene, 24(8), 885-897. We present measurements of Sr/Ca, δ18O, and spectral luminescence ratios (G/B) from a mid-Holocene Porites sp. microatoll recovered from the nearshore Great Barrier Reef (GBR). These records were used as proxies to reconstruct sea surface temperature (SST), the δ18O of surrounding seawater (δ18Osw), and riverine influence, respectively, and compared with records from a modern Porites sp. microatoll growing in the same environment. Strong riverine influence in the mid-Holocene record is indicated by (1) an increased annual δ18Osw range in the mid-Holocene record, (2) negative peaks in δ18O characteristic of flood events, and (3) a higher G/B luminescence ratio. Seasonal cycles in G/B suggest that humic acid inputs were elevated for a longer portion of the year during the mid-Holocene. The seasonal cycle of δ18Osw peaked earlier in the year in the mid-Holocene record relative to the modern, while mean δ18Osw values from the mid-Holocene record were similar to modern values. These records provide an insight into the oceanographic conditions the nearshore GBR experienced during mid-Holocene climatic shifts and are consistent with a strong Australian-Indonesian Summer Monsoon (AISM) system at ~ 4700 cal. yr BP. © the Author(s) 2014. Roche RC, Perry C, Smithers SG, Leng MJ, Grove CA, Sloane HJ, Unsworth C (2014). Mid-Holocene sea surface conditions and riverine influence on the inshore Great Barrier Reef. The Holocene: a major interdisciplinary journal focusing on recent environmental change Full text. Salter MA, Perry CT, Wilson RW (2014). Size fraction analysis of fish-derived carbonates in shallow sub-tropical marine environments and a potentially unrecognised origin for peloidal carbonates. Sedimentary Geology, 314, 17-30. © 2014 Elsevier B.V. Marine bony fish are now known as primary producers of calcium carbonate. Furthermore, within the shallow sub-tropical platform settings of the Bahamas, this production process has been shown to occur at rates relevant to carbonate sediment production budgets. Fish excrete these carbonates as loosely aggregated pellets which, post-excretion, exhibit a range of distinctive crystal morphologies and have mineralogies ranging from low (0-4mol% MgCO3) to high (4-40mol% MgCO3) Mg-calcites, aragonite and amorphous carbonate phases. Here we provide the first quantitative assessment of the size fractions of the carbonates produced by a range of tropical fish species, and document the extent of post-excretion carbonate pellet break down under a range of physical agitation conditions. Specifically, we document the morphologies and size fractions of: i) intact pellets at the point of excretion; ii) intact pellets after agitation in seawater; and iii) the particles released from pellets post-disaggregation. Results indicate that fish-derived pellets initially fall within the very fine to very coarse sand fractions. Exposure to conditions of moderate seawater agitation for 30days results in significant pellet diminution; 66% of initial pellet mass being released as individual particles, whilst 34% is retained as partially intact pellets that are smaller (fine sand-grade) and more rounded than initial pellets. In contrast, pellets exposed to very gently agitated conditions for up to 200days show little change. Where pellet disaggregation does occur, particles are commonly released as individual clay- and silt-grade crystals. However, some morphotypes (e.g. polycrystalline spheres) can be intergrown and are released as strongly cohesive particle clusters falling within the coarse silt to fine sand fractions. Only very vigorous agitation may disaggregate such particles, resulting in the release of their component clay-grade crystals. We conclude that fish-derived carbonates may thus contribute not only to the mud-fraction of marine carbonates, but also to the fine sand fraction as intergrown particles, and to the fine to coarse sand fractions as intact and partially intact pellets. These experimental data indicate that hydrodynamic regimes local to sites of excretion will influence the generation of carbonates with different size fraction ranges. Rapid pellet disaggregation is more likely in high energy settings, hypothesised to result in redistribution of liberated mud-grade particles to lower energy platform-top settings and/or off-platform. In contrast, pellets excreted in lower energy settings are more likely to be preserved intact, and are thus proposed as a previously unrecognised source of pelletal and peloidal carbonate sediments. •Break-up of carbonate pellets produced by marine bony fish is investigated. •Pellets can remain intact and may contribute to sedimentary pellets and peloids. •Rapid pellet break-up releases component particles in agitated settings. •Particle size ranges from clay to fine sand grade: different depositional fates. •Relevant to surface sediments in shallow sub-tropical marine provinces. Salter MA, Perry C, Wilson RW (2014). Size fraction analysis of fish-derived carbonates in shallow sub-tropical marine environments and a potentially unrecognised origin for peloidal carbonates. Sedimentary Geology, 314, 17-30. Full text. Berkeley A, Perry C, Smithers SG, Hoon SH (2014). Towards a formal description of foraminiferal assemblage formation in near shore environments: qualitative and quantitative concepts. Marine Micropalaeontology, 112, 27-38. Gulliver P, Palmer S, Perry C, Smithers S (2013). Are coral clasts from a turbid near-shore reef environment a suitable material for radiocarbon analysis?. Radiocarbon, 55(2-3), 624-630. Use of coral skeletons to determine growth histories of reefs situated in warm, clear tropical waters is well established. Recently, however, there has been increasing awareness of the significance of reefs occurring in environments that are considered as marginal for coral growth, such as turbid inshore settings characterized by episodes of elevated turbidity, low light penetration, and periodic sediment burial. While these conditions are generally considered as limiting for coral growth, coral reefs in these settings can exhibit high live coral cover and species diversity, and thus can be both ecologically and geologically significant. Turbid-zone reefs are also commonly concentrated along eroding shorelines with many analogues to erosional shorelines developed during the Holocene transgression. A growing number of studies of these previously undocumented reefs reveal that the reef deposits are detrital in nature, comprising a framework dominated by reef rubble and coral clasts and set within a fine-grained terrigenous sediment matrix. In addition to the recognized effects of diagenesis or algal encrustations on the radiocarbon signature of coral samples, episodic high-energy events may rework sediments and can result in age reversals in the same stratigraphic unit. As in other reef settings, the possibility of such reworking can complicate the reconstruction of turbid-zone reef growth chronologies. In order to test the accuracy of dating coral clasts for developing growth histories of these reef deposits, 5 replicate samples from 5 separate coral clasts were taken from 2 sedimentary units in a core collected from Paluma Shoals, an inshore turbid-zone reef located in Halifax Bay, central Great Barrier Reef, Australia. Results show that where care is taken to screen the clasts for skeletal preservation, primary mineralogical structures, and δ13C values indicative of marine carbonate, then reliable 14C dates can be recovered from individual turbid reef coral samples. In addition, the results show that these individual clasts were deposited coevally. © 2013 by the Arizona Board of Regents on behalf of the University of Arizona. Perry CT, Smithers SG, Gulliver P (2013). Rapid vertical accretion on a ‘young’ shore-detached turbid zone reef: Offshore Paluma Shoals, central Great Barrier Reef, Australia. Coral Reefs, 1-6. Author URL. Full text. Perry CT, Kench PS, Smithers SG, Yamano H, O'Leary M, Gulliver P (2013). Time scales and modes of reef lagoon infilling in the maldives and controls on the onset of reef island formation. Geology, 41(10), 1111-1114. Faro are annular reefs, with reef fl ats near sea level and lagoons of variable depth, characteristic of both the perimeter and lagoons of Maldivian (Indian Ocean) atolls. Their geomorphic development remains largely unknown, but where faro lagoons (termed velu in Maldivian) have infilled and support reef islands, these provide precious habitable land. Understanding the timing and modes of velu infilling is thus directly relevant to questions about reef island development and vulnerability. Here we use a chronostratigraphic data set obtained from a range of atoll-interior faro with partially to fully filled velu (including those with reef islands) from Baa (South Maalhosmadulu) Atoll, Maldives, to determine time scales and modes of velu infilling, and to identify the temporal and spatial thresholds that control reef island formation. Our data suggest a systematic relationship between faro size, velu infilling, and island development. These relationships likely vary between atolls as a function of atoll lagoon depth, but in Baa Atoll, our data set indicates the following faro-size relationships exist: (1) faros 0.5 km2 but ~1.25 km2 have unfilled (deeper) velu which might only infill over long time scales and which are thus unlikely to support new island initiation. These new observations, when combined with previously published data on Maldivian reef island development, suggest that while the velu of the largest faro are unlikely to fill over the next few centuries (at least), other faro with near-infilled velu may provide important foci for future reef-island building, even under present highstand (and slightly rising) sea levels. © 2013 Geological Society of America. Perry C, Smithers SG, Gulliver P, Browne N (2012). Evidence of very rapid reef accretion and reef growth under high turbidity and terrigenous sedimentation. Geology (Boulder), 40, 719-722. Full text. Wilson RW, Reardon EE, Perry CT (2011). A fishy tale: a missing part of the inorganic ocean carbon cycle. The Biochemist(June), 30-34. Author URL. Perry CT, Smithers SG (2011). Cycles of coral reef ‘turn-on’, rapid growth and ‘turn-off’ over the past 8,500 years: a context for understanding modern ecological states and trajectories. Global Change Biology, 17, 76-86. Full text. Perry CT, Salter MA, Harborne AR, Crowley SF, Jelks HJ, Wilson RW (2011). Fish as major carbonate mud producers and missing components of the tropical carbonate factory. Proceedings of the National Academy of Science, 108, 3865-3869. Full text. Perry CT, Salter MA, Harborne AR, Crowley SF, Jelks HL, Wilson RW (2011). Fish as major carbonate mud producers and missing components of the tropical carbonate factory. Proc Natl Acad Sci U S A, 108(10), 3865-3869. Fish as major carbonate mud producers and missing components of the tropical carbonate factory. Carbonate mud is a major constituent of recent marine carbonate sediments and of ancient limestones, which contain unique records of changes in ocean chemistry and climate shifts in the geological past. However, the origin of carbonate mud is controversial and often problematic to resolve. Here we show that tropical marine fish produce and excrete various forms of precipitated (nonskeletal) calcium carbonate from their guts ("low" and "high" Mg-calcite and aragonite), but that very fine-grained (mostly < 2 μm) high Mg-calcite crystallites (i.e. > 4 mole % MgCO(3)) are their dominant excretory product. Crystallites from fish are morphologically diverse and species-specific, but all are unique relative to previously known biogenic and abiotic sources of carbonate within open marine systems. Using site specific fish biomass and carbonate excretion rate data we estimate that fish produce ∼6.1 × 10(6) kg CaCO(3)/year across the Bahamian archipelago, all as mud-grade (the < 63 μm fraction) carbonate and thus as a potential sediment constituent. Estimated contributions from fish to total carbonate mud production average ∼14% overall, and exceed 70% in specific habitats. Critically, we also document the widespread presence of these distinctive fish-derived carbonates in the finest sediment fractions from all habitat types in the Bahamas, demonstrating that these carbonates have direct relevance to contemporary carbonate sediment budgets. Fish thus represent a hitherto unrecognized but significant source of fine-grained carbonate sediment, the discovery of which has direct application to the conceptual ideas of how marine carbonate factories function both today and in the past. Perry CT, Kench PS, Smithers SG, Riegl BR, Yamano H, O'Leary MJ (2011). Implications of reef ecosystem change for the stability and maintenance of coral reef islands. Global Change Biology, 17, 3679-3696. Full text. Roche R, Perry CT, Johnson KG, Saltana K, Smithers SG, Thompson AA (2011). Mid-Holocene coral community data as a baseline for understanding contemporary reef ecological states. Palaeogeography, Palaeoclimatology, Palaeoecology, 299, 159-167. Perry CT, Smithers SG, Wassenburg J, Roche R (2011). Recurrent patterns of coral community and sediment facies development through successive phases of Holocene reef growth and decline. Marine Geology, 289, 60-71. Roche R, Abel RA, Johnson KG, Perry CT (2011). Spatial variation in porosity and skeletal element characteristics in apical tips of the branching coral Acropora pulchra (Brook 1891). Coral Reefs, 30, 195-201. Perry CT, Smithers SG (2010). Evidence for the episodic 'turn-on' and ‘turn-off' of turbid-zone, inner-shelf coral reefs during the late Holocene sea-level highstand. Geology, 38, 119-122. Browne N, Smithers SG, Perry CT (2010). Geomorphology and community structure of Middle Reef, central Great Barrier Reef, Australia: an inner-shelf turbid zone reef subjected to episodic mortality events. Coral Reefs, 26, 683-689. O'Leary M, Perry CT (2010). Holocene reef accretion on the Rodrigues carbonate platform: an alternative to the classic ‘bucket-fill’ model. Geology, 38, 855-858. Palmer SE, Perry CT, Smithers SG, Gulliver P (2010). Internal structure and accretionary history of a Holocene nearshore, turbid-zone coral reef: Paluma Shoals, central Great Barrier Reef, Australia. Marine Geology, 276, 14-29. Roche R, Abel RA, Johnson KG, Perry CT (2010). Quantification of porosity in Acropora pulchra (Brook 1891) using X-ray micro-computed tomography techniques. Journal of Experimental Marine Biology & Ecology, 396, 1-9. Berkeley A, Perry CT, Smithers SG (2010). Taphonomic signatures and patterns of test degradation on tropical, intertidal benthic foraminifera. Marine Micropalaeontology, 73, 148-163. Berkeley A, Perry CT, Smithers SG, Horton BP, Cundy AB (2009). Foraminiferal biofacies across mangrove-mudflat environments at Cocoa Creek, north Queensland, Australia. Marine Geology, 263, 64-86. Perry CT, Berkeley A (2009). Intertidal substrate modification as a result of mangrove planting: impacts of introduced mangrove species on sediment microfacies characteristics. Estuarine, Coastal and Shelf Science, 81, 225-237. Perry CT, Smithers SG, Johnson KG (2009). Long-term coral community records from Lugger Shoal on the terrigenous inner-shelf of the central Great Barrier Reef, Australia. Coral Reefs, 28, 941-948. Perry CT, Smithers SG (2009). Stabilisation of intertidal cobbles and gravels by Goniastrea aspera: an analogue for substrate colonisation during marine transgressions?. Coral Reefs, 28, 805-806. O'Leary MJ, Perry CT, Turner J, Beavington-Penney SJ (2009). The significant role of sediment bio-retexturing within a contemporary carbonate platform system: implications for carbonate microfacies development. Sedimentary Geology, 219, 169-179. Perry CT, Smithers SG, Palmer SE, Larcombe P, Johnson KG (2008). A 1200 year paleoecological record of coral community development from the terrigenous inner-shelf of the Great Barrier Reef. Geology, 36, 691-694. Perry CT, Spencer T, Kench PS (2008). Carbonate budgets and reef production states: a geomorphic perspective on the ecological phase-shift concept. Coral Reefs, 27, 853-866. Perry CT, Berkeley A, Smithers SG (2008). Microfacies characteristics of a tropical, mangrove-fringed shoreline, Cleveland Bay, central Great Barrier Reef, Australia: mangrove sequence development and facies preservation. Journal of Sedimentary Research, 78, 77-97. Perry CT, Hepburn LJ (2008). Syn-depositional alteration of coral reef framework through bioerosion, encrustation and cementation: taphonomic signatures of reef accretion and reef depositional events. Earth-Science Reviews, 86, 106-144. Berkeley A, Perry CT, Smithers SG, Horton BP (2008). The spatial and vertical distribution of living (stained) benthic foraminifera from a tropical, intertidal environment, north Queensland, Australia. Marine Micropalaeontology, 69, 240-261. Perry CT (2010). Carbonate budgets and reef framework accumulation. In (Ed) Encyclopaedia of Modern Coral Reefs, Springer-Verlag, 185-190. Kench PS, Perry CT, Spencer T (2010). Coral Reefs. In (Ed) Geomorphology and Global Environmental Change: Landscape Scale Implications, Cambridge: Cambridge University Press, 180-213. Perry CT (2010). Holocene high energy window. In Hopley D (Ed) Encyclopaedia of Modern Coral Reefs, Springer-Verlag, 558-561. Perry CT (2010). Turbid-zone and terrigenous sediment-influenced reefs. In (Ed) Encyclopaedia of Modern Coral Reefs, Springer-Verlag, 1110-1120. © the authors 2018. Parrotfish are important bioeroders on coral reefs, and thus influence reef carbonate budgets and generate large volumes of carbonate sand that contribute to local beach and reef island maintenance. However, despite the importance of this process, there is a paucity of data with which variations in bioerosion rates as a function of species, feeding modes, and body size of parrotfish can be constrained. There is, in addition, limited knowledge regarding how resultant rates may vary within and between reef-building regions. Here, direct estimates of parrotfish bioerosion rates were quantified across different size classes of 6 common species of Maldivian parrotfish. These species comprise both 'scraper' and 'excavator' taxa, and our data indicate marked variations in mean bioerosion rates among these species. We also note that all species exhibited an apparent bimodal feeding cycle, with peaks in the late morning and early afternoon. Highest bioerosion rates were found in the 'excavator' Chlorurus strongylocephalus (∼460 kg ind.-1 yr-1), nearly 130 times greater than rates calculated for comparably sized (>45 cm) 'scraper' species. Our data provide metrics that can be used in conjunction with parrotfish biomass or density data to improve estimates of parrotfish bioerosion on central Indian Ocean reefs, a region of high parrotfish density, but from which only limited metrics exist. We emphasise the importance of obtaining sub-regional scale process data to better inform estimates of reef bioerosion, especially to support attempts to model the impacts of fishing pressure, which commonly results in removal of high-rate bioeroding taxa.